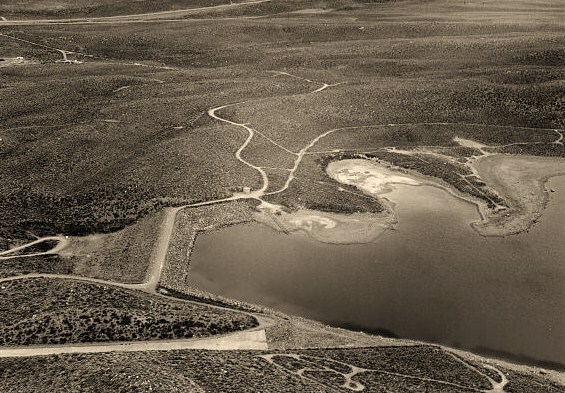 Photograph shows a bird’s-eye view of a large reservoir with mountains in the background and highway in the foreground, in Los Angeles, California. 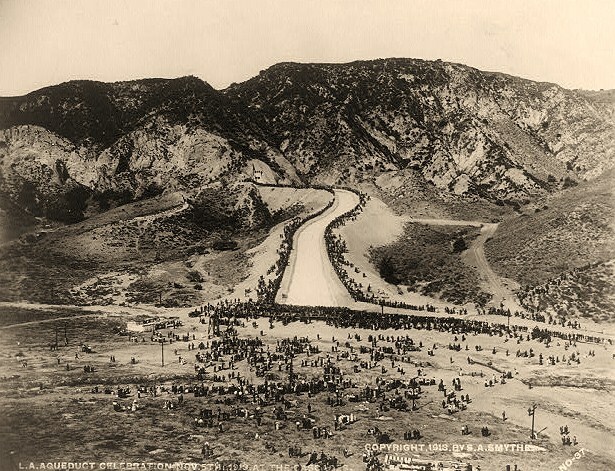 A century ago William Mulholland oversaw the creation of one of the greatest engineering projects of the 20th century – the building of the 200 mile long Los Angeles Aqueduct – and the growing city of Los Angeles, amid considerable conflict, appropriated water from a rural area 250 miles away. 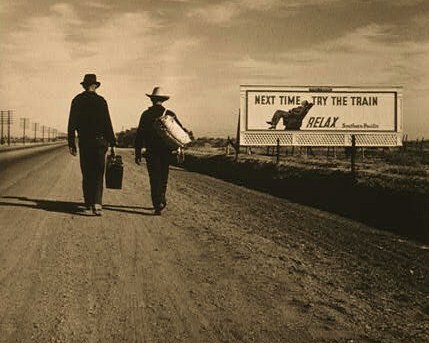 Still unresolved, the controversy surrounding the Owens Valley-Los Angeles Aqueduct has long since moved from the personal, even violent level fictionalized in the movie Chinatown to the dry realm of court proceedings, injunctions, and environmental impact reports. But water remains a problem in California, and the questions raised by these events — the rights of a rural area versus a growing metropolitan area, environmental issues, and levels of government responsibility — are of recognized national importance today. 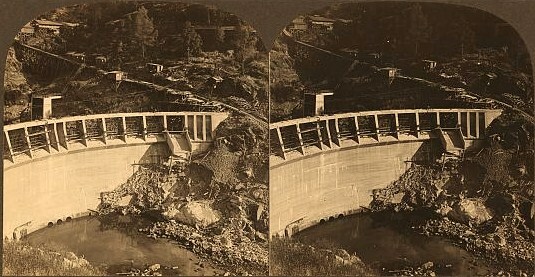 Stereograph showing view from elevated vantage point of the Kerckoff Dam and spillway. Much of the history of the controversy has been incompletely or imperfectly reported. Conventional accounts have focused on city versus valley, overlooking the role of the federal government. Others espouse the “conspiracy” theory popularized in Chinatown, dealing in plots and personalities. Illustration showing bird’s-eye view of mountainside, tunnel opening, canal forming Owensmouth Cascase, and crowd celebrating the opening of the gates releasing water from the Owens River into San Fernando Valley via canal. Relying on primary sources, many unused until now, Dr. Hoffman demonstrates how the utilitarian views of Theodore Roosevelt and his agents in the Geological Survey, the Reclamation Service, and the Bureau of Forestry helped determine the future of Los Angeles and the fate of Owens Valley. A model of historical reporting, this book redresses the balance in a record that too often has been oversimplified, usually at the expense of the city and often in terms of heroes and villains.